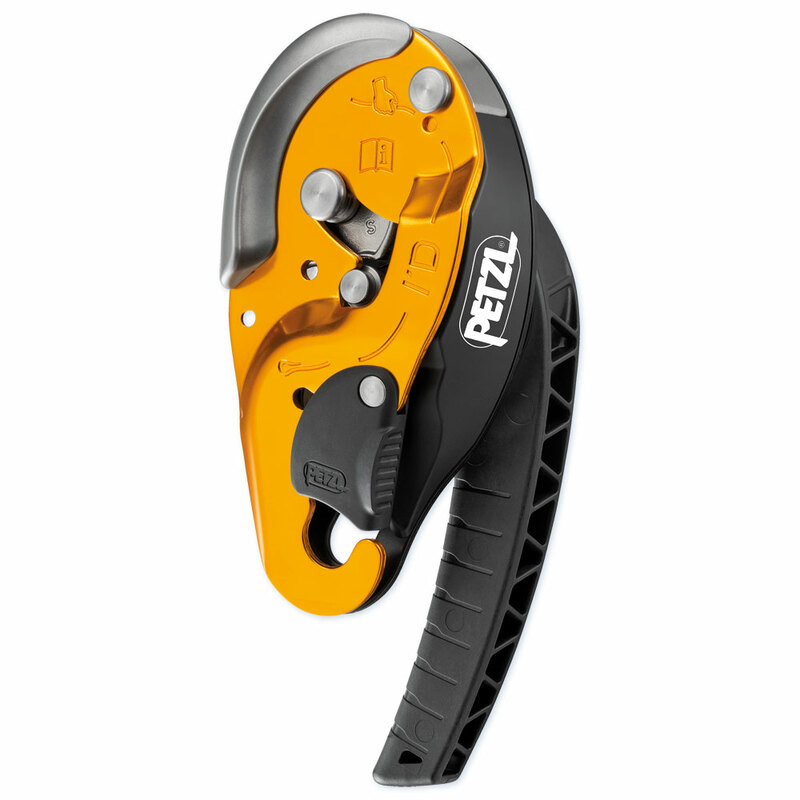 Self-braking descender such as the Petzl I'd, Rig, or SMC Spider offer additional control the descent, and are popular among professionals in the tree care industry. Often used at the basal anchor in SRT climbing systems. Self-braking descender for work on ropes, which allows the operator to lower themselves on the working line, to position himself on the working line and to ascend the same rope. Equipped with a braking spur that creates additional friction on the rope, when used during the descent, without the use of an additional connector. A multi-functional command lever with an automatic recall system allows the operator to descend at a controlled speed and stop the descent at the desired point without the need to tie off the device. An EBS safety system (Extraordinary Braking System) is activated if the lever is accidentally fully opened, reducing the speed of descent instead of increasing it. Petzl I'D Small (2019) New in 2019! Self-braking descender with anti-panic function for work at height and rope access work. The self-braking I'D S descender is designed for work at height and rope access work. It has an ergonomic handle that allows comfortable descent control. The integrated anti-panic function and anti-error catch limit the risk of an accident due to user error. The AUTO-LOCK system allows users to easily position themselves at a work station without having to manipulate the handle or tie off the device. Once locked, the rope can be taken up without having to manipulate the handle. The safety gate allows the rope to be installed with the device remaining connected to the harness. I'D S is compatible with 10 to 11.5 mm ropes and allows handling of loads up to 250 kg. This self-braking descender and belay device for single rope replaces a figure 8 or friction knot. The handle allows the rope to move, and descent is controlled with the free hand. If handle is released the cam is engaged and descent stops. Anti-panic device automatically brakes if the handle is pulled too far. Two models available: I'D S accepts up to 7/16” (11mm) rope. I'D L accepts up to 1/2” (13mm) rope. The RIG allows the user to move into position then easily stop where needed. This descender is compact and intuitive to use, making for smooth descents. A simple and effective alternative to more traditional descenders. The RIG’s handle allows the user to switch quickly between descent and stopping for work. While the handle is in descent position, it will automatically return to belay position if the user lets go of it. This limits risks in case of involuntary operation of the handle, for example by user action, a falling object, etc. The RIG is better-adapted for professional use. Pivoting cam facilitates taking up the slack in the rope. Can also be used to make a reversible haul system, and for short ascents (in conjunction with a FOOTPRO foot loop and an ASCENSION handled rope clamp). Single ropes between 10.5 and 11.5 mm in diameter (7/16” ). This device is for users that already have considerable experience. For professionals that are still learning technical rope access skills, we recommend the Petzl I’D Descender, which has additional safety features, such as an anti-panic function and an anti-error safety cam. Weighs 400 grams. Instructions included. 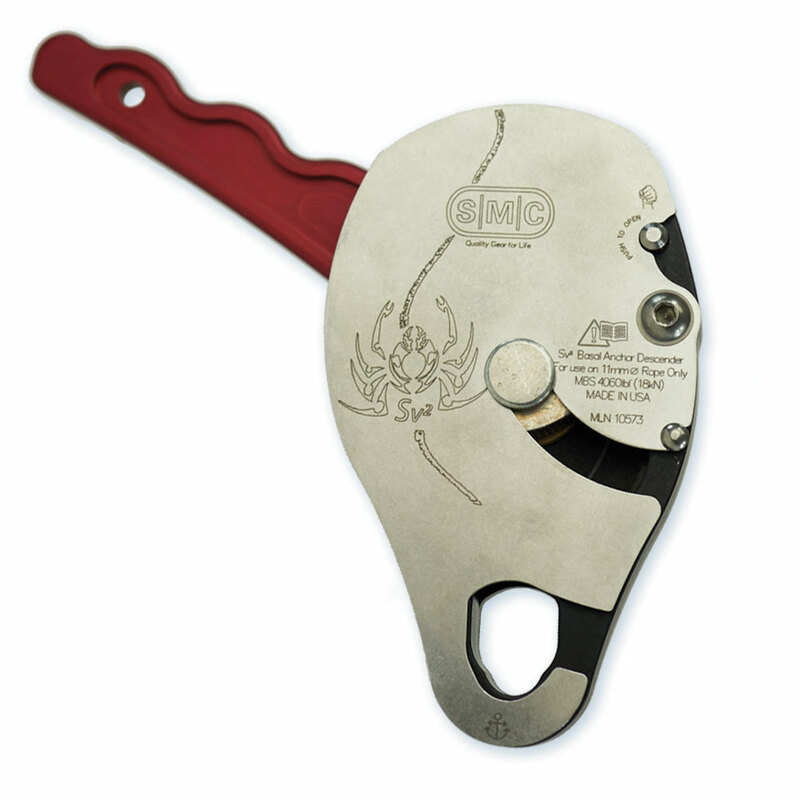 The SMC Spider is an Auto Braking NFPA T Rated Descender designed for work positioning and personal descent. The Spider provides person working at height the ability to easily maneuver and secure themselves while on the fly. Allowing users to easily load and unload from the device without having to unclip from their harness, it is an ideal descender for window washers, fire fighters and industrial workers who need a device that provides them with optimal strength and performance. Accepts rope from 11 - 12.5mm in diameter, MBS 13.5kN (3,174 lbf), weighs 19.8 oz (562 g). SV2 Basal Anchor by SMC New in 2019! Feedback gathered from highly qualified and experienced 'Pro' users highlighted a demand for a device which does not incorporate a panic-brake function. Enter the D4PRO! The D4PRO Descender is the same great Work/Rescue Descender, but without the panic brake. D4 PRO Details: WLL 529 lb (240 kg), weighs 24 oz, and works with ropes from 10.5mm to 11mm (7/16”). This Descender from ISC features some unique features for a handled descender. The handle is aluminum and coated for grip, and designed to rotate 360°, making it easier to use and switch between allowing the rope to run and locking the device. Each station in the rotation is accompanied by a “Click” so that you have the audio feedback in addition to the feel of switching the position. Features an anti-panic brake if the handle is rotated too far by an inexperienced user. These devices have great video and manuals on the D4 descender page. D4 Details: 5 1/2” x 3 1/4”, weighs 23 oz, and works with ropes from 10.5mm to 11mm (7/16”). D5 Details: 240 kg/500 lb WLL, weighs 29 oz, and works with ropes sized 12.7mm (1/2”). Belay device with assisted braking and anti-panic handle, for all single rope diameters (8.5 to 11 mm). The GRIGRI + is an assisted braking device designed for all climbers, for both indoor and outdoor climbing. It can be used with all single ropes (optimized for 8.9 to 10.5 mm diameter ropes) and is suited for intensive use. The reduction handle offers exceptional descent control. Two usage modes to choose from, depending on need: top-rope belay or lead belay. The top-rope belay mode and the anti-panic handle make for a more comfortable belay, making the GRIGRI + particularly suitable for learning.